It has been a busy time at Anzhi Makhachkala, home of one of the billionaire-backed Russian clubs. Guus Hiddink, the Dutch football master, resigned from his post as Anzhi’s manager and left almost everyone shocked by his sudden decision. The 66-year old manager had been at Anzhi since 2012, but only one season after his arrival he decided to leave – and this despite signing a new contract in June. Hiddink’s popularity in Russia was quite high after his spell with the country’s national team and Anzhi’s board were banking on his help in reshaping the club and preparing them to be one of Europe’s top teams. But, the football world is full of surprises and on the 22nd July, Hiddink claimed that his work at Anzhi was done, that he was proud of having been part of the project and that he was certain that the club would still be in good hands, despite his departure. The Dutchman had made some noises about retiring from front line management, but his contract extension seemed to hint those ideas had disappeared. When Hiddink claimed that he was leaving the club in good hands, he was probably talking about Rene Meulensteen. The former Manchester United’s first team coach had joined Anzhi earlier this season to work as Hiddink’s assistant manager on a one-year deal. However, things have changed too fast: only after two Russian Premier League matches Hiddink left the club and on that same day the club’s board appointed Meulensteen as the new Anzhi coach. Some might wonder if Meulensteen is prepared to tackle such a demanding task, especially since over the last six years he did not work as a head coach. His last managerial experience was in 2006 with Danish side Brondby, where he succeeded in winning a Danish League Cup, but the team ended the Danish Superliga season in sixth. After his short spell at Brondby, he returned to Manchester United, the club he had served as a coach between 2001 and 2006, to replace Carlos Queiroz, further cementing a good relationship with Sir Alex Ferguson. In some quarters he was considered the mastermind behind Manchester United’s style of play and his departure last June caught fans by surprise. 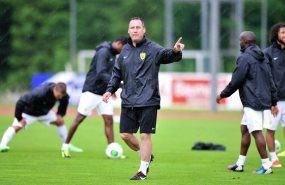 At Anzhi, things will not be easy for Meulensteen. The club finished third in the Russian Premier League last season and going one better this season is nothing if not tough. Anzhi have started this edition of Russian Premier League on the wrong foot, winning none of their four games so far. There are mitigating factors, tough clashes against Lokomotiv Moscow and Dynamo Moscow, but fans were certainly expecting something different against Krylia Sovetov Samara and FC Rostov, the former game drawn and the latter lost 1-0 at home. Anzhi spent big again during the summer and the arrivals of the Russian internationals Igor Denisov and Aleksandr Kokorin left fans quite excited. The Dagestan giants have a very interesting team, with some top quality and experienced players. Samuel Eto’o, Yuri Zhirkov, Oleg Shatov, Willian, Vladimir Gabulov, and the two newcomers will certainly offer Meulensteen everything he needs to build up a consistent and powerful team. Meulensteen will certainly have the opportunity to implement the Dutch football style, which is quite similar to the former Soviet style, with a team that are a sort of work in progress and that are trying to make an impact in Europe as well as Russia. The club’s president, Suleyman Kerimov, a successful businessman and philanthropist, had claimed in the past that he wants the club to create a high-quality football academy, to develop their own young players, and he has given Anzhi all the financial assistance they need. When taking this into account, Meulensteen was probably the best option to succeed Hiddink, since he has solid knowledge regarding the development of young players and knows how to implement a winning mentality.